Now, I was simply buzzing about on facebook, as I am known to do, when I came across this little gem. “It’s extreme masculinity – not love or despair – that drives a father to kill his children“. Hahaha, ok – lets go a head and simply put things in perspective. “data from the U.S. Dept. of Health and Human Services (DHHS) tells a completely opposite story regarding who abuses children. The DHHS publishes an annual report called “Child Maltreatment”, and each year’s report contains a table detailing the parental status of the perpetrator(s). Shown below is an analysis of data drawn from the “Child abuse and neglect” and the “Child fatality” tables from each of the DHHS’ “Child Maltreatment” reports between 2001 and 2006. The DHHS calculates the percentages of perpetrators in various categories such as Mother, Father, Foster Parent, Daycare Staff, Friend or Neighbor, etc. The percentages are often used to argue whether, on average, it is fathers or mothers that pose a greater risk of harm to their children. But when trying to determine which parent, on average poses the greater danger, categories like Foster Parent, Daycare Staff, Friend or Neighbor, etc. are entirely irrelevant. The calculations below factor out those categories to produce a more accurate picture. The resulting calculations show the percentage of child abuse and deaths caused by one parent acting either alone or in concert with someone other than the child’s other parent. Furthermore, contrary to media portrayals that leave the viewer with the impression that only girls are ever harmed, boys constituted fully 60% of child fatalities. (Table 4-3, p. 71, Child Maltreatment 2006, reports that 675 boys died in 2006 as compared to 454 girls). Also, if it’s “Extreme” (or “Toxic”) Masculinity which leads men to kill their children… well what about this woman who killed her two daughters before turning the gun on herself? Was she, a woman, suffering from Extreme/Toxic MASCULINITY? Or should we ascribe it to Extreme/Toxic Femininity? “Toxic Masculinity” (used more often than “Extreme Masculinity”) is a red herring. It’s a way of stating that behaviors they don’t like or agree with are wrong and should be changed so that men behave more like women. Instead of an out right demonizing of masculinity – it’s a collusion tactic, like the HeForShe speech, an appeal to emotion in order to exert manipulation and therefore collude neutral parties to your cause. In one part of Watson’s speech she says that if men start acting more like women they will have, and I quote “permission to be human.” I did an un-edited but fully annotated version of Watson’s speech for one of my articles on HBB. They also ascribe “toxic masculinity” as a way to define criminal behavior amongst men: in order to create subliminal connections – Masculinity = criminality. Criminality = male. This creates subconscious associations between between men being criminals by nature and masculinity being criminal by nature. That way they can pretend “toxic masculinity” is real, and -pretend- they’re not ascribing all negative events to being men’s fault. Never mind the fact – that women enact the same behaviors, the same crimes, and in most arenas: they actually do it more often. Society simply chooses not to pay attention to what women do. This is why when you say “Domestic Violence” you think of a man beating a woman – in reality: according to the CDC, Harvard University and over 300 large scale studies on the subject: that’s ardently contrary to reality. Harvard did their own study on domestic violence, independent of the CDC, and come up with the same results by the way. In spite of all of this: when we hear the words “Domestic Violence”, we think of a man beating a defenseless woman. The reality of the situation is, not only are women twice as violent in relationships, they’re more than twice as likely to initiate violence – and, the pièce de résistance – men are literally unlikely to be violent unless women initiate violence upon them first. And Feminists will exclaim: Domestic Violence is the result of “Toxic Masculinity”. In order to associate masculinity with being toxic, masculinity with being criminal and men by definition being inherently violent. MOST importantly: it is in order to ignore the fact that women are the primary SOURCE of domestic violence. If you can incriminate men by association of being male, you can alter the focal point of blame and thus ignore the fact that women are the ones who are actually violent. It’s the exact same method being employed by the above article. “Extreme Masculinity” is the source of criminal behavior. Which negates femininity and women from being associated with murdering children: in spite of the fact that as stated well above – they do so more than twice as often as men. You’ll find no better example of this kind of activity than Anita Sarkeesian’s Murdergasm. Another one of Hannah Wallen’s writings, on which I personally interviewed Hannah about, you can listen to that show at this location. 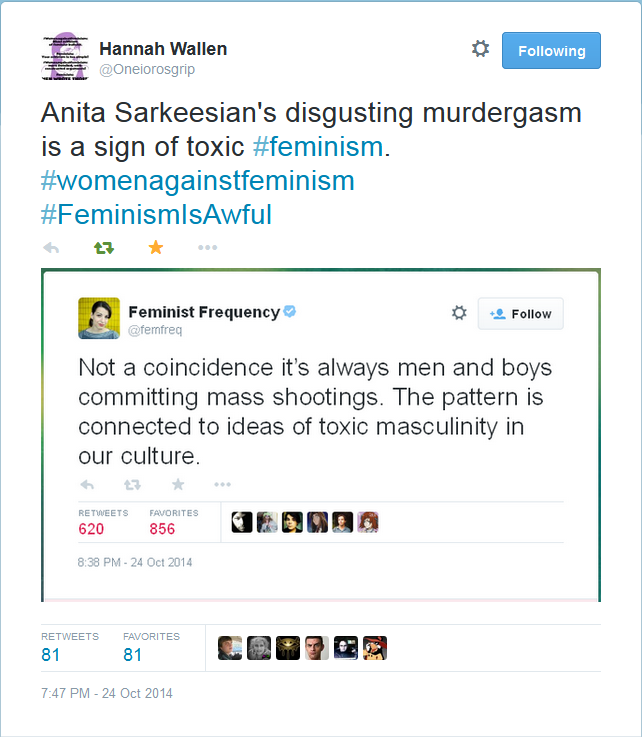 As Hannah pointed out in her article Murdergasm, Anita Sarkeesian took advantage of a school shooting to promote herself and was tweeting about it before several of the children were even off the operating table. That’s the depths to which she sunk, she was tweeting her gender rhetoric while people’s children were still in surgery clinging to life, and before the dead had gone cold. As if that weren’t enough: as Hannah so skillfully pointed out in her article…. women have been responsible for plenty of school shootings. Not only was it an act of inhumanity to tweet self promotion using people’s dead, dying and or barely alive children – she went full Goebbels propaganda-machine by relaying false information. As I stated in my article “Feminist End Game: The Final Solution“. These are all (literally) textbook examples of Dehumanization. Great article. Thanks for putting the work into it. I think you’re absolutely right. Ideology is used to direct people away from thinking critically about actual facts. It’s all too easy to believe that men are just naturally violent, but that is not actually true of most men any one of us actually knows. Greta article. You ask the obvious question. That question is so painful that the only answers I have heard so far come down to deflections or hypoagentive excuses. Toxic feminists don’t believe in violent women. Rhonda Rousey. The top fighter, model, and face of women’s MMA can’t sell her book because Walmart says its too violent. Yet they sell books with zombies and patriots that kill. You don’t see feminists jumping to protect this star athlete. I’m sure many out there would but the extremists won’t touch a woman like this at all. Pretty much the same as the conservative religious folk out there. One, I’m pretty sure DKos is a largely pro-feminist site, given that they’re the source of that “Elliot Rodger is an MRA” meme. Two, there’s a difference between fantasy violence, and recounting real-world violence. The “Violence Against Women Act” codifies the idea that, in domestic violence, men are the perpetrators and women are the victims when it’s been known since the 1970s, based on numerous studies, that there is, in fact, parity in domestic violence. Women are just as much perpetrators of domestic violence as men, initiate it more often, and not in self-defense and where a weapon is used it is more often women wielding it. The “Violence Against Women Act”, the perfect example of Congressmen who violate their oath of office to uphold the Constitution. Every time they vote for renewal of this sexist bill which violates men’s Bill of Rights guarantees. Sod it im off to become a gerbil. sod all you humans. We’re always hearing how women retain custody of the children in 90% of the cases… why then do women only represent 70% of the DV against the kids? If men only retain custody to their children 10% of the time (as is oft-quoted), then how is it possible that we account for 30% of DV against the children? Mathematically, I do not understand how men account for 300% more likelihood of hurting their kids. We have them 10% of the time yet hurt them 30% of the time. Women have the kids 90% of the time, yet only hurt the 70% of the time. This makes us look worse y’all, not better. You are assuming child abuse only occurs after divorce or separation. Hi i have hear about you and i want to debate. I think that the word “toxic masculinity” is used for people like trpers. It isnt a word to use in all men. I dont know because i have read this word only a few times. In my country this word dont exist. I want to say for describe trpers. This word is used only for describe misoginists. Came across a news story a while ago about a man and his children who died in a house fire. Police automatically blamed him for setting it deliberately. The wife, who was ‘out at the time’ was never even considered as a suspect.